Direct to product digital printing involves the transfer of ink directly from the print heads of an inkjet machine to the product and can be used to produce both spot colour and full colour branding on flat or slightly curved surfaces. 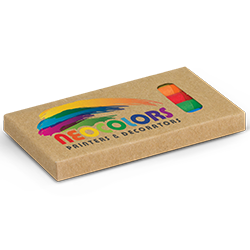 Ideal for printing dark coloured products as a layer of white ink can be printed under the artwork. Can print variable data including individual names. Only one set up charge is required irrespective of the number of print colours. Instant drying so products can be shipped immediately. Offers larger print areas on many products and can print very close to the edge of flat products. Only approximate PMS colours can be reproduced. Some colours cannot be reproduced including metallic silver and gold. Larger print areas tend to be more expensive. Artwork can be supplied in either vector or bitmap format. A 3mm bleed should be added to the artwork if it bleeds off the product.